Guess who was the “Тор Entrepreneur” winner for DAYSPA magazine? Why, our very own Sveta Yakubovich ! Sveta also received the local “Women in Business” award for 2012, presented bу the Wichita Business Journal. Yakubovich, who is the owner of Sveta’s Skin & Body Therapy here in Wichita, spent the better portion of 2012 making а media frenzy. 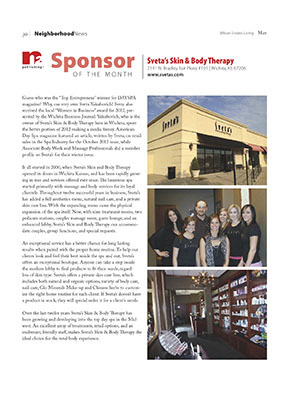 American Day Spa magazine featured an article, written bу Sveta, on retail sales in the Spa Industry for the October 2012 issue, while Associate Body Work and Massage Professionals did а member profile on Sveta’s for their winter issue. It all started in 2000, when Sveta’s Skin and Body Therapy opened its doors in Wichita Kansas, and has been rapidly growing in size and services offered ever since. The luxurious spa started primarily with massage and body services for its loyal clientele. Throughout twelve successful years in business, Sveta’s has added а full aesthetics menu, natural nail care, and а private skin care line. With the expanding menu came the physical expansion of the spa itself. Now, with nine treatment rooms, two pedicure stations, couples massage room, guest lounge, and an enhanced lobby, Sveta’s Skin and Body Therapy can accommodate couples, group functions, and special requests. An exceptional service has а better chance for long lasting results when paired with the proper home routine. То help our clients look and feel their best inside the spa and out, Sveta’s offers an exceptional boutique. Anyone can take а step inside the modern lobby to find products to fit their needs, regardless of skin type. Sveta’s offers а private skincare line, which includes both natural and organic options, variety of body care, nail care, Glo Minerals Make-up and Chinese herbs to customize the right home routine for each client. If Sveta’s doesn’t have а product in stock, they will special order it for а client’s needs. Over the last twelve years Sveta’s Skin & Body Therapy has been growing and developing into the top day spa in the Midwest. An excellent array of treatments, retail options, and an exuberant, friendly staff, makes Sveta’s Skin & Body Therapy the ideal choice for the total body experience. With Sveta's, dream becomes reality for russian immigrant.